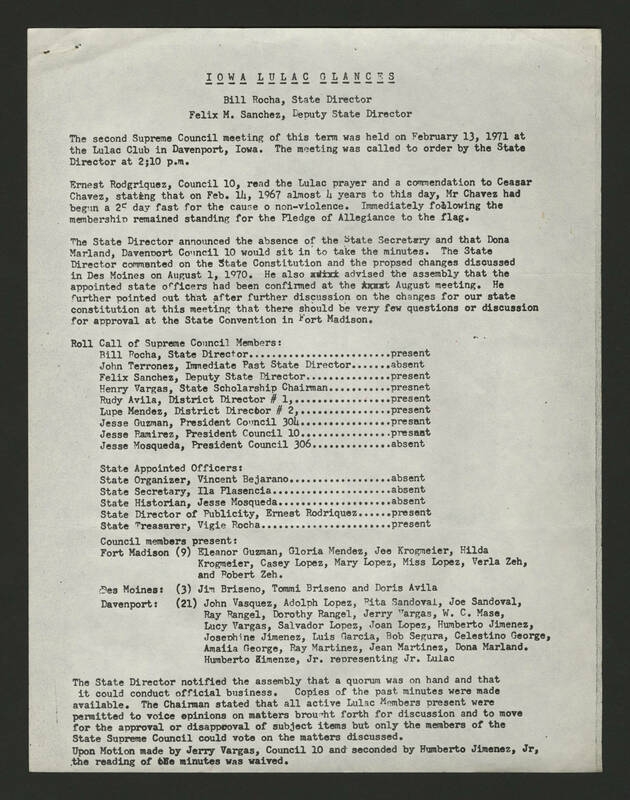 I O W A L U L A C G L A N C E S Bill Rocha, State Director Felix M. Sanchez, Deputy State Director The second Supreme Council meeting of this term was held on February 13, 1971 at the Lulac Club in Davenport, Iowa. The meeting was called to order by the State Director at 2;10 p.m. Ernest Rodgriquez, Council 10, read the Lulac prayer and a commendation to Ceasar Chavez, stating that on Feb. 14, 1967 almost 4 years to this day, Mr Chavez had begun a 25 day fast for the cause o non-violence. Immediately following the membership remained standing for the Pledge of Allegiance to the flag. The State Director announced the absence of the State Secretary and that Dona Marland, Davenport Council 10 would sit in to take the minutes. The State Director commented on the State Constitution and the propsed changes discussed in Des Moines on August 1, 1970. He also advised the assembly that the appointed state officers had been confirmed at the August meeting. he further pointed out that after further discussion on the changes for our state constitution at this meeting that there should be very few questions or discussion for approval at the State Convention in Fort Madison. Roll Call of Supreme Council Members: Bill Rocha, State Director.....present John Terronez, Immediate Past State Director.....absent Felix Sanchez, Deputy State Director.....Presnet Henry Vargas, State Scholarship Chairman.....present Rudy Avila, District Director #1,.......present Lupe Mendez, District Director #2,.....present Jesse Guzman, President Council 304.....presant Jesse Ramirez, President Council 10.....presant Jesse Mosqueda, President Council 306.....absent State Appointed Officers: State Organizer, Vincent Bejarano.....absent State Secretary, Ila Plasencia....absent State Historian, Jesse Mosqueda....absent State Director of Publicity, Ernest Rodriquez.....present State Treasurer, Vigie Rocha.....present Council members present: Fort Madison (9) Eleanor Guzman, Gloria Mendez, Joe Krogmeier, Hilda Krogmeier, Casey Lopez, Mary Lopez, Miss Lopez, Verla Zeh, and Robert Zeh. Des Moines: (3) Jim Briseno, Tommi Briseno and Doris Avila Davenport: (21) John Vasquez, Adolph Lopez, Rita Sandoval, Joe Sandoval, Ray Rangel, Dorothy Rangel, Jerry Vargas, W.C. Mase, Lucy Vargas, Salvador Lopez, Joan Lopez, Humberto Jimenez, Josephine Jimenez, Luis Garcia, Bob Segura, Celestino George, Amalia George, Ray Martinez, Jean Martinez, Dona Marland, Humberto Kimenze, Jr. representing Jr. Lulac The State Director notified the assembly that a quorum was on hand and that it could conduct official business. Copies of the past minutes were made available. The Chairman stated that all active Lulac Members present were permitted to voice opinions on matters brought forth for discussion and to move for the approval or disapproval of subject items but only the members of the State Supreme Council could vote on the matters discussed. Upon motion made by Jerry Vargas, Council 10 and seconded by Humberto Jimenez, Jr., the reading of the minutes was waived.